ZoneOptions is one of the newest binary options brokers on the market. Despite the fact that ZoneOptions does not yet have a very large user base, it still manages to offer top-of-the-line trading possibilities and attractive payout rates. The services offered at ZoneOptions are recommended both for starters and experienced traders due to the fact that pretty much all types of binary options are available – including some with payouts as high as 360%. In addition, they offer a robust educational resources section, which enables newcomers to learn every aspect of online trading and will make sure that experienced traders have all existing options at their disposal. Several binary options strategies are available for each one of these assets. Traders can choose from the typical High/Low binary option type to the one touch and zone binary options types. This gives room to more strategy and the possibility to place various betting combinations. It’s very easy to create an account at ZoneOptions. The first thing to do is to access the registration page that will ask the trader to introduce his or her registration data. It’s very important to remember that all the personal data that is asked should be completed accurately. Online traders might in some situations ask users to send in scans of personal documents in order to check if the data matches. One of the unique features of ZoneOptions is its availability on mobile platforms. Most traders cannot be accessed from these platforms making it difficult for users that travel a lot to use them. ZoneOptions is available on a multitude of platforms such as iPhone, iPad, Android devices and BlackBerry. ZoneOptions also has a detailed market analysis feature. This feature will enable users to evaluate the market in detail by following latest news and developments in major industries. Detailed market analysis reports are also provided every day. This will create a better overview of the market and allow users to develop a better strategy. The most optimal form of communication with the ZoneOptions support staff is through live chat. The live chat option will quickly connect the trader with a support professional who will be competent to answer all kinds of questions. ZoneOptions is one of the few traders that are also available over the phone. Phone support is available in English, French, Spanish and Italian which is a huge plus. Users may as well call the operations center of ZoneOptions in urgent situations, something that is definitely not available elsewhere. The binary options demo account at ZoneOptions allows users to test the services offered without making a real money deposit. The demo account is actually not a real account per se. Instead ZoneOptions allow unregistered persons to try out all the options offered without any login required. Testing all the features and options free of charge and without registration is a huge advantage that is not available at most other binary options providers. The most common payout rates at ZoneOptions range from 60%-85%. Some of the Above/Below and High Yield options available and ZoneOptions can offer payout rates of up to 360% which is extremely high in this industry. One of the possible drawbacks of ZoneOptions is the fact that it only offers a limited selection of depositing and withdrawal methods. Still, the most popular options are available and will suffice in satisfying the large majority of people. These options are MasterCard, Visa, Wire Transfer and Diners Club International. Probably the best promotion offered is the First Trade Risk Free offer. This promotion will refund the user with 100% of the traded amount if the first binary option prediction was not correct. This is an extremely advantageous offer not available at other providers. 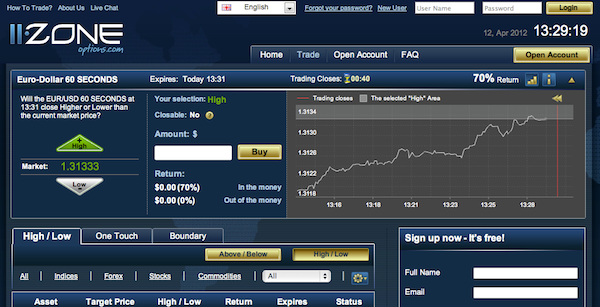 Traders may also receive a binary options bonus on their first real money deposit. The bonus will be calculated using a tier system that looks as follows: in case of a first deposit between 250 and 499 currency a 20% bonus will be applied; between 500 and 999 currency – 30% bonus; above 1000 currency – 40% bonus. Users may as well earn free money by referring friends to ZoneOptions. A fixed amount of 50 EUR/USD/GBP will be awarded to a user that refers a real money depositing friend. There is no upper limit on how many times this bonus can be claimed. Despite the fact that ZoneOptions is not one of the biggest binary options providers on the market, users will be excited to find a large selection of trading possibilities. In fact, a lot of the trading options available here are not available at some of the most popular brands on the market. The available trading options are balanced to satisfy customers from around the globe. As explained above, ZoneOptions can be recommended to both starters and experts due to the large amount of trading possibilities. The only negative aspect of this brand is the lack of an extensive portfolio of deposit and withdrawal solutions.